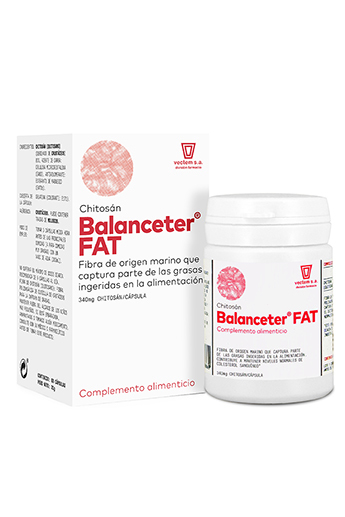 BALANCETER FAT , vectem s.a.
Dietary supplement with chitosan, a marine fibre concentrate safe for oral intake. Helps with weight loss, capturing fat before it is digested. Chitosan becomes soluble in the acidic environment of the stomach and protects the gastric mucosa thanks to its demulcent properties. The pH of the stomach causes chitosan to form a gel which traps lipids in the intestine, preventing their absorption. Indicated for the treatment of overweight. Captures fat, preventing its absorption into the body.